See also Cobalt Fusion No. 2 by LongShorty. Info: Created on 9th July 2011 . Last edited on 10th July 2011. Yeah, I haven’t updated all the characters for this interpretation, and the numerals probably could use some more attention, but I did manage to include a special flueron (* character) featured in the sample and worthy of mention. It was not easy to achieve! This reminds me quite a bit of another work that deserves mention: kix’s fantastic Asgardian. Congratulations! FontStruct Staff have deemed your FontStruction worthy of special mention. 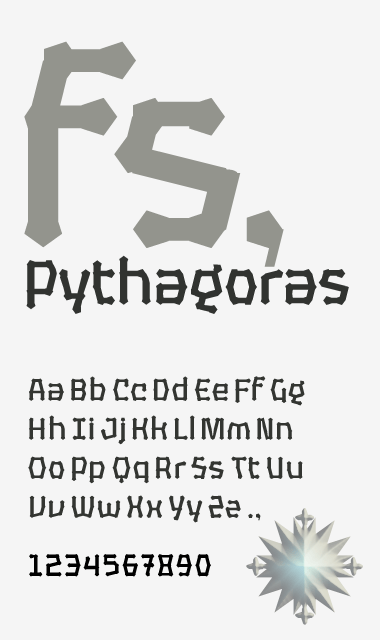 “fs Pythagoras” is now a Top Pick.